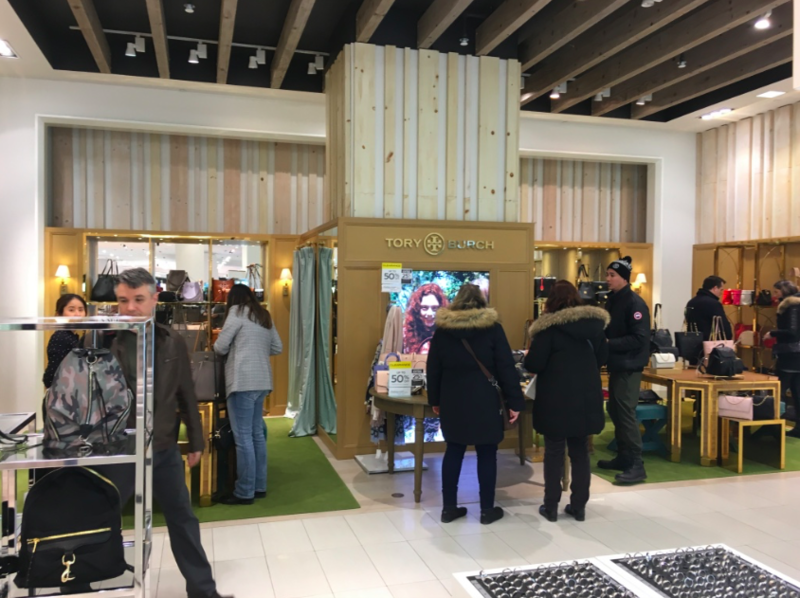 Hudson’s Bay’s Queen Street flagship in Toronto is embracing ‘experiential retail’ with a new activation on its seventh floor, as well as a range of designers and services throughout that have resulted in the store being the top producer in the chain, by far. We toured the store last week and took photos for this article, some of which are in a series of slideshows. The massive eight-level flagship store occupies the south end of the CF Toronto Eaton Centre in a standalone building that is connected both on the underground subway level as well as by an architecturally impressive walkway over Queen Street West (near Yonge Street). Hudson’s Bay occupies more than 800,000 square feet in the building, making it the largest department store location in Canada. As well, the Canadian flagship location for Saks Fifth Avenue occupies nearly 170,000 square feet in the historic building which was once the flagship for department store chain Simpson’s. Saks occupies four floors, including a basement level food hall operated by Pusateri’s Fine foods. 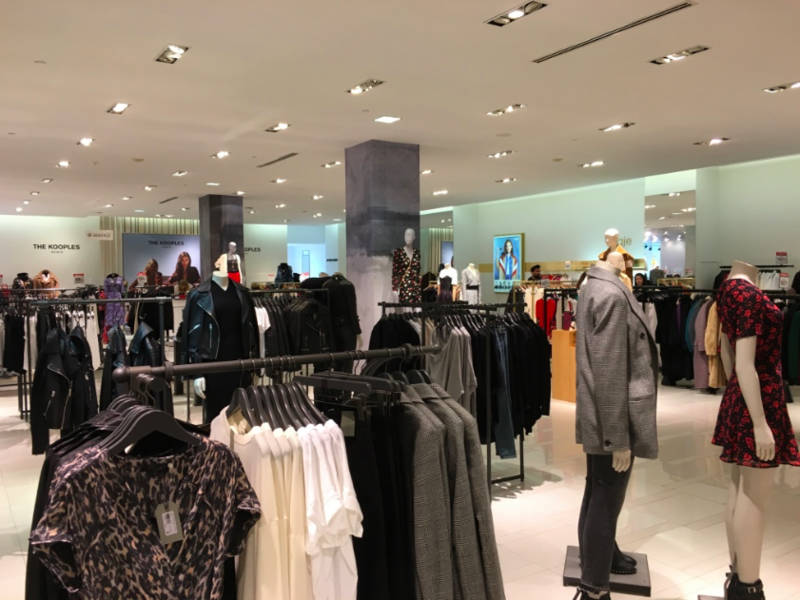 Last week, Hudson’s Bay unveiled a unique Instagram-friendly area to its seventh floor that was packed with visitors when we were there. Called ‘The 7’, the experiential space features eight unique rooms that are full of colour, art and 3D visuals. Admission is free and the exhibit is open to the public until March. Below is a slideshow of The 7. Visitors are greeted at the elevators by some friendly creatures. Image: Hudson’s Bay Co. Impressive display at The 7 at Hudson’s Bay Queen Street. Image: Hudson’s Bay Co.
A peek through one of the holes in the Bay Street windows. WeWork on the sixth floor of Hudson’s Bay Queen Street in Toronto. 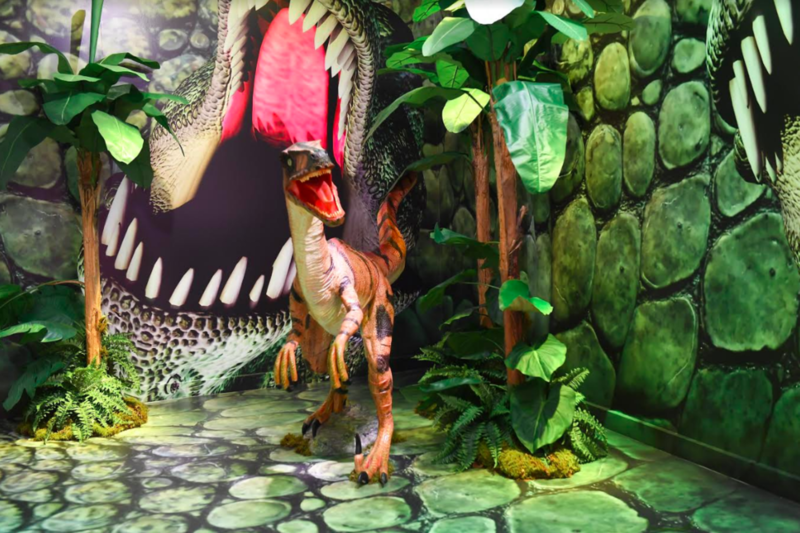 Displays from the FAO Schwartz pop-up which launched in October for the Christmas season. More sale items from FAO Schwartz, with WeWork behind it. Above are photos from the store’s sixth floor. At one time it housed a homewares floor, some of which has been relocated to the basement level. WeWork has carved out space on part of the sixth floor, and will eventually occupy most of the store’s seventh floor as well (Kleinfeld bridal will remain on that level as well we’re told). ‘Luxury area’ on the men’s floor. 'Luxury area' on the men's floor. Paul Smith boutique on the 5th floor men’s store. Swiss menswear brand Strellson occupies more than 2,000 square feet on the 5th floor of Hudson’s Bay Queen Street. The large Polo Ralph Lauren shop-in-store. Above is a slideshow from the fifth floor of Hudson’s Bay Queen Street, which features about 100,000 square feet of menswear, footwear and accessories. The men’s store was relocated in early 2015 and its assortment is impressive. A ‘luxury area’ features brands such as Balmain, Marni, Moschino, Yeezy, Neil Barret and others. There are also concessions for brands such as Sandro and The Kooples, and shop-in-stores for Strellson, Polo Ralph Lauren, Karl Lagerfeld, Ted Baker and others. Last year a Paul Smith area opened on the men’s floor, and is currently the only Bay store in the country to carry such an extensive assortment of the Paul Smith main line. 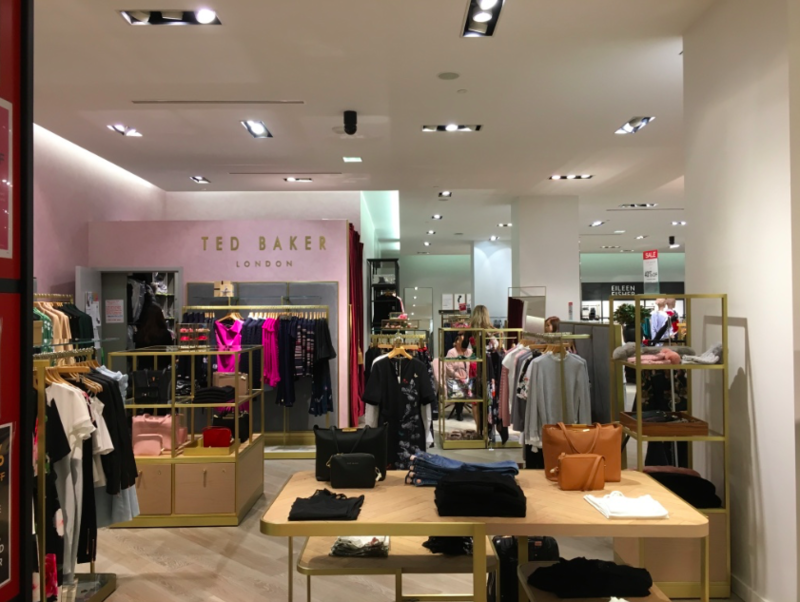 Ted Baker women’s concession on 3. 4th floor women’s department, featuring unique lighting. Women’s fashions occupy the entire third and fourth floors of Hudson’s Bay’s Queen Street flagship, with photos above. The fourth floor includes more traditional styles and brands you’d find in a suburban Hudson’s Bay store. The third floor features an extensive selection of designer brands, including a mix of leased concessions and designer branded areas. 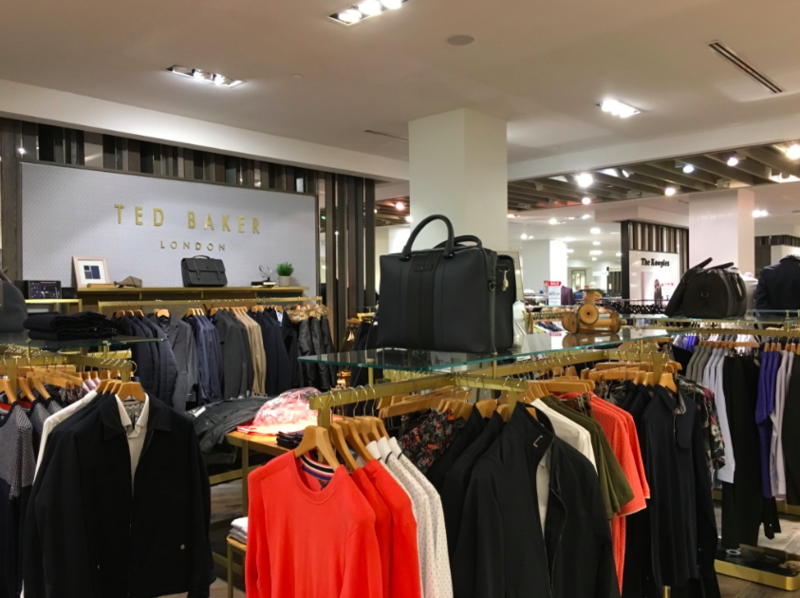 Concessions for Ted Baker, Sandro, Maje and other brands mix with shop-in-stores for The Kooples, Weekend by Max Mara, Vince, Theory, Eileen Fisher, Hugo Boss and others. Interestingly, quite a few of the brands carried in this part of Hudson’s Bay Queen Street were once carried at Holt Renfrew. Holts has since focused on a narrower, wealthier/higher spending customer, and had dropped many of the brands that Hudson’s Bay subsequently picked up. Entrance to The Room — the dynamic space is constantly being reinvented. Luxury brand Alaia has its own area in The Room on 3. Interestingly, Saks Fifth Avenue on the same floor to the east also features an Alaia boutique. Women’s Moschino area in The Room. 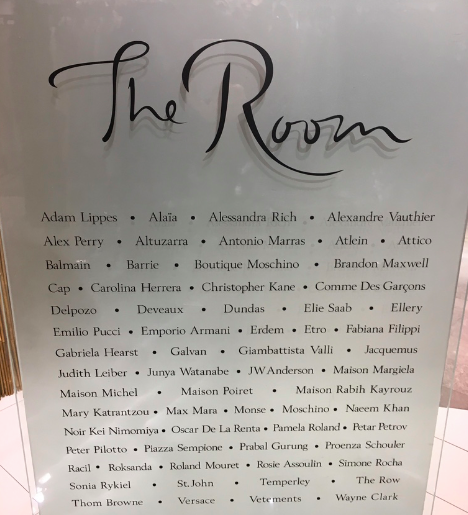 By far the most expensive women’s department, called ‘The Room’, occupies the western portion of the store’s third floor (see photos above). The Room, which spans about 17,000 square feet, features edgy designer fashions as well as evening wear and even ballgowns, some priced in excess of $10,000. Brands such as Balmain, Sonia Rykiel, Moschino, Oscar de la Renta, Proenza Schouler, Vetments and Emporio Armani can be found — to the right is a list of designers in The Room, provided by Hudson’s Bay. There’s even an area dedicated to Azzedine Alaia and Hudson’s Bay is one of only a handful of stores in Canada carrying the pricey brand. Dramatic mirrored ceilings with art installation. The Room shoes, featuring some of the world’s priciest footwear brands. Video wall adjacent to women’s shoes. The screen is a draw for visitors crossing from the pedway leading to CF Toronto Eaton Centre. 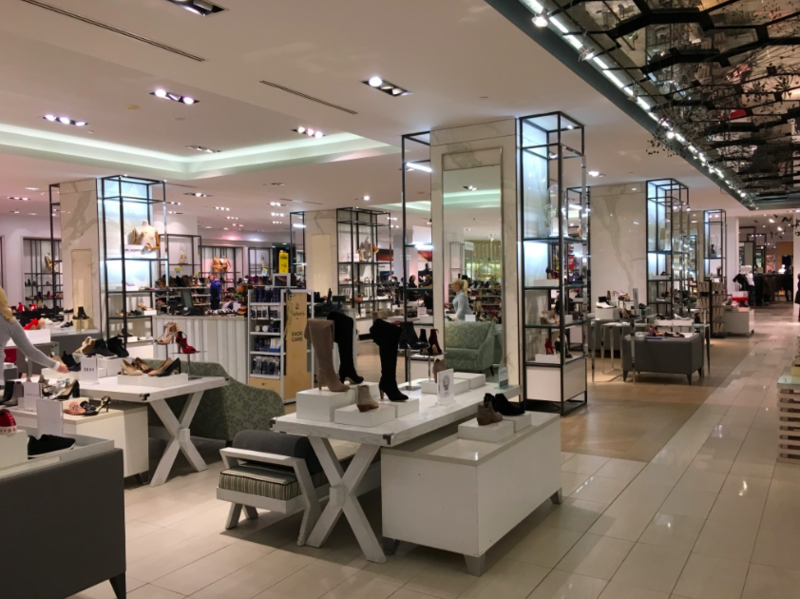 Above are photos of Hudson’s Bay Queen Street’s second level, which features some women’s categories as well as Canada’s largest footwear hall. The architecture is impressive and included is an area called ‘The Room shoes’, featuring some styles priced into the thousands by some of the world’s top brands. The Ten Spot, a spa/beauty provider, opened on the Bay Street side of Hudson’s Bay Queen Street over the weekend. The Ten Spot was formerly located on the store’s concourse level. 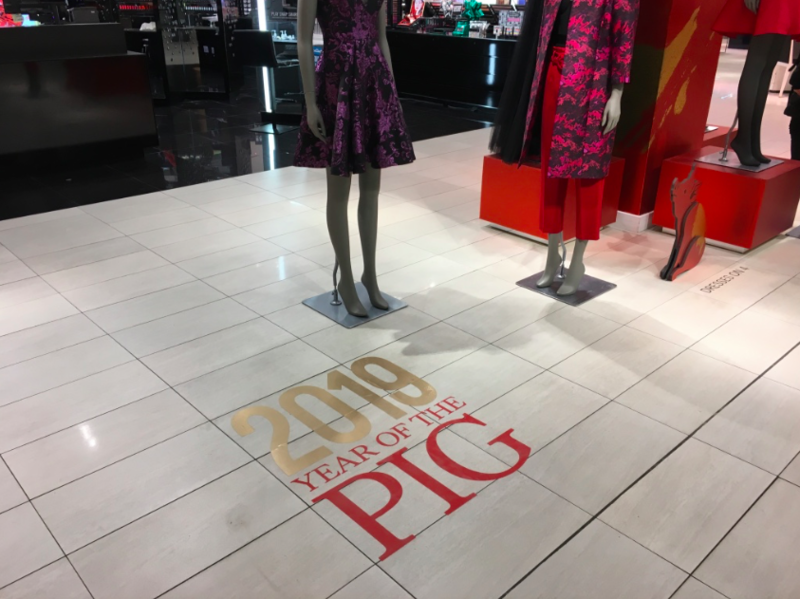 Retailers across Canada are marking Chinese New Year. Hudson’s Bay Queen Street’s ground floor includes a mix of beauty brands, leather goods, jewelry and accessories. The bright space is busy with an impressive roster of beauty shops as well as dedicated areas for handbags from brands such as Tory Burch, Coach and Marc Jacobs. Watches priced into the thousands can be found in one department. Looking east towards the Saks Fifth Avenue food hall. Homewares on the concourse level. The basement level of Hudson’s Bay Queen Street features a mix of homewares and shop-in-stores for candy brands such as Godiva and Squish Candies, as well as Nespresso. The new homewares floor isn’t quite as dramatic as when it occupied the store’s sixth floor. After visiting Hudson’s Bay’s relatively impressive Queen Street flagship in downtown Toronto, we took a trip several subway stops north to Hudson’s Bay’s six-level store above the Yonge & Bloor TTC subway station. Some of Canada’s wealthiest residents live nearby, and the area is growing quickly with many affluent new households. The subway station is also the busiest in Canada with over 300,000 daily passengers. Signage on the front of the store has not been updated. Despite signage having been updated in most Hudson’s Bay stores in Canada, the location at Yonge & Bloor in Toronto has not, raising questions about the future of the store. Ground floor men’s store: Pricier designer offerings have been removed from the store and replaced with brands typical to most HBC stores. Basement level men’s department at Hudson’s Bay, 44 Bloor St. E. in Toronto. The 340,000 square foot Hudson’s Bay store at 44 Bloor Street East (in the Hudson’s Bay Centre/2 Bloor Street East complex at the corner of Yonge Street) is a remarkable contrast to the larger Queen Street flagship. The Bloor Street store has not been renovated in years and exterior signage has not been replaced, as has been the case for most Hudson’s Bay stores in Canada. The Yonge and Bloor Hudson’s Bay store is about 500 feet east of Holt Renfrew’s 50 Bloor Street West flagship, not to mention the rest of the upscale ‘Mink Mile’. If Hudson’s Bay decides to keep this store open, it has the oppportunity to create something attractive and considerably more upscale. Such was the case with El Corte Ingles on Calle Serrano in Madrid’s affluent Salamanca area. Split into two standalone stores, both are skewed towards luxury brands, some of which are not even carried in the chain’s luxury brand-heavy Castellana flagship. 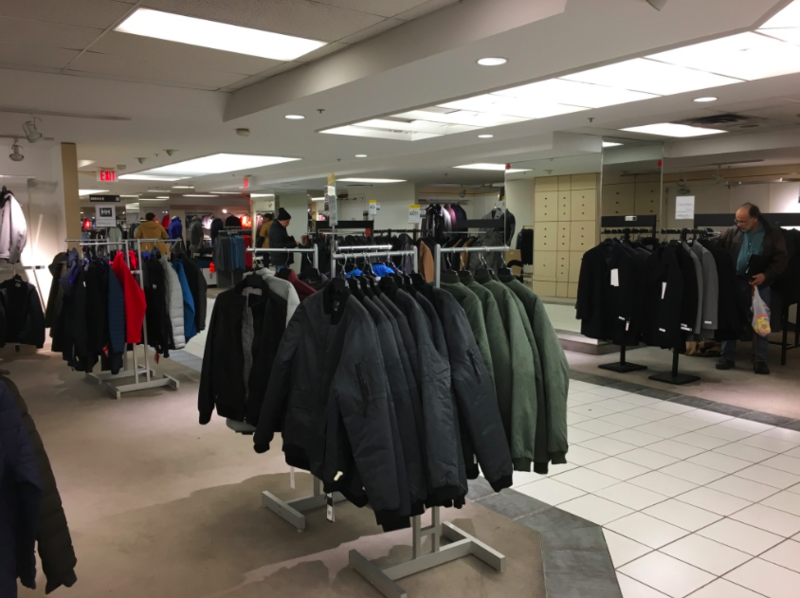 Retail Insider will be touring department stores, shopping centres and urban streets in Canada throughout 2019 and will be reporting with updates as well as some of our opinions about what we’re seeing.